Aluminium Trays – Red bag (please rinse). Asbestos – Hazardous waste. Contact Newport City Council for disposal advice. Audio Cassettes – Not recyclable. The plastic cover can be recycled by the tape inside cannot. Batteries (Household) – Most large supermarkets have battery deposit stands. We DO NOT collect these. Try using rechargeable batteries (these have improved greatly in recent years). Batteries (car) – These are hazardous waste. When you buy a new battery for your car you will be paying for recycling of the old battery. Never pour battery acid down a drain or into a water course. Biscuit wrappers – Cannot be recycled. Bicycles – Sell it, give it away to a good home or donate it to the Tip Shop at the Council recycling centre on Docks Way. Blinds – Take to the Council recycling centre on Docks Way. Books – Donate to charity shops or the Tip Shop down at the Council recycling centre on Docks Way. Bottle tops – Red bag (if on glass leave top on bottle and recycle with glass). Bubblewrap – Can’t be recycled but it can be reused. Bulky Household Items – If good enough to reuse contact the Wastesavers Reuse Centre on 01633 216 855. If in poor condition contact Newport City Council bulky waste collection service. Camping Gas Cylinders(used) – Small ones in red bag. Large ones take to the Council recycling centre on Docks Way. Cans – Red bag – give them a rinse first – helps keep you bag clean. Car Batteries – When you buy a replacement battery you will already be paying for the recycling of the old one. If it’s a spare battery take to the Council recycling centre on Docks Way. Cardboard – Green box and green sack. We also accept small amount put to the side of your box / bag if, when folded, it’s the same size as the green bag/box. Larger amounts are bulky waste (see here for guidelines). Please call the council to arrange a bulky waste collection. Cards – Green box or bag. Carpets – Cannot be recycled. Take to the Council recycling centre on Docks Way or arrange for bulky waste collection from the council. Cat Litter – Cannot be recycled or put in with food waste. In general rubbish only please. Cereal packets – Green box or bag. The inner plastic bag can be recycled along with plastic bags at most large supermarkets. Ceramics -If not broken – donate to charity shop. If broken in general rubbish. Do NOT put in with glass. Christmas Decorations – Most cannot be recycled (unless 100% paper). In general rubbish. Christmas Trees – Wastesavers does not collect these but Newport City Council can for a small fee as bulky waste or under the garden waste collection from March onwards. Clingfilm – Cannot be recycled. Clinical Waste – Cannot be recycled. This includes baby and adult nappies, sanitary products, bandages, syringes etc. Clothes and Textiles – Blue box. Coat hangers – All metal can go in red bag. Metal and plastic ones cannot be recycled. Charity shops may find useful. Coffee pods – We do not collect them. Take them to the household recycling centre on Docks Way. Gross over-packaging. Compost – Newport Council run the green garden waste collection service for much of the year. Computers – If broken – blue box. If working contact Wastesavers Reuse Centre or donate to the Tip Shop at the Council recycling centre on Docks Way. Cooking oil – Take to the Council recycling centre on Docks Way. Corks – Plastic type in red bag. Cork can be composted but not in food waste. Crisp packets – At the Recycling centre on Docks Way. We DO NOT collect them. Crockery – If unbroken – donate to a charity shop. If broken – this cannot be recycled. DIY/Builders Waste – We do not collect these materials. Small amounts can be taken to the Council recycling centre on Docks Way. Larger amounts need a licenced waste company – check their credentials before you hire. DVDs and CDs – Cannot be recycled but if still working donate to charity shop or the Tip Shop. Egg-boxes – Green box or green bag. Engine Oil – Not at kerbside but taken down at the Council recycling centre on Docks Way. NEVER pour down a drain. Expanded polystyrene – This cannot be recycled. Fat – Food kitchen caddy. Flooring – Not at kerbside but taken down at the Council recycling centre on Docks Way. Fluorescent Tubes – Take to the Council recycling centre on Docks Way. This should NOT go with glass. Foil – Thin cooking foil only if clean. More heavy foil trays in red bag (please rinse). Fridges and Freezers – If working in good condition contact Wastesavers Reuse Centre. If broken contact the Council for collection or take to the Council recycling centre on Docks Way. Furniture – If good condition donate to Wastesavers Reuse Centre. Garden Waste – Home composting is best. If no space Newport Council runs a seasonal garden waste collection service. Garden furniture – Take to the Council recycling centre on Docks Way. If reusable then donate to Tip Shop. Giftwrap – If paper, blue box. (No need to remove sticky tape). Foil style gift wrap cannot be recycled. Glass – Green Box (Bottles and jars only). Pyrex, toughened glass, and all types of sheet glass in general waste. Larger amounts (eg windows) take to the Council recycling centre on Docks Way. HDPE– 2 (High density polyethylene) – Red sack for smaller items (bottles etc). Larger items like toys and garden chairs please take to the Council recycling centre on Docks Way. If reusabel – donate to Tip Shop. Ink Cartridges – Blue Box or get re filled – check online. Jiffy Bag – These cannot be recycled. Kitchen Towels – Cannot be recycled – too dirty. Laptops – Blue Box if broken. Contact Wastesavers Reuse Centre if working. LDPE – 4 (Low density polyethylene) Plastic bags, yokes holding six packs of tins together. We DO NOT COLLECT. Most large supermarkets have collection points. Leaves – Compost at home or use council garden waste service. Lightbulbs – Take to the Council recycling centre on Docks Way. They should NOT go with glass. Mattresses – Take to the Council recycling centre on Docks Way. Sprung type are the only ones that can be recycled. Medicine – Glass bottles – green box. Plastic bottles – red bag. Card – green box. Sheets for pills – red bag. Microwave ovens – Take to the Council recycling centre on Docks Way. These are too large for the blue box. Mobile Phones – Blue box. Nappies – CANNOT be recycled. Try using a reusable nappy service. general wste. Oil (cooking) – Take to the Council recycling centre on Docks Way. Oil (engine) – Take to the Council recycling centre on Docks Way. Paint – Take to the Council recycling centre on Docks Way. Unused paint may be accepted at the Tip Shop. Pizza boxes (take away) – Green Box. Please remove any food and/or plastic. Plant pots – Not at kerbside but taken down at the Council recycling centre on Docks Way. Plastic Bags – Do NOT put in your kerbside recycling. Most supermarkets have plastic bag recycling points. Plastic netting (around fruit) – Cannot be recycled. Plastics – Red bag (no plastic bags or plastic film). If labelled see entries in this list. PS – 6 (Polystyrene) – Cannot be recycled. 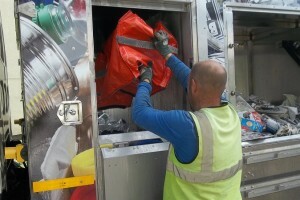 PVC – Take to the Council recycling centre on Docks Way. Sheets (bedding) – Blue box. Stationery – Most is some kind of paper or card. Lever arch files cannot be recycled (too much of a mix of metal and card). Tassimo coffee capsules – Dump the machine – gross over-packaging – If you do have one the capsules can be recycled at Council recycling centre on Docks Way. We DO NOT collect them. Televisions – If fully working flat screen – donate to Wastesavers Reuse Centre. Older deep TV are not accepted (they cannot sell them). All TVs are classed as hazardous waste. If broken – take to the Council recycling centre on Docks Way. Tins – Red bag. (Please rinse). Tools – Donate to reuse centre or Tip Shop at the Council recycling centre on Docks Way. Toys – If reusable donate to charity shop or Tip Shop. If broken in general waste – larger ones take to the Council recycling centre on Docks Way. Tyres – You pay for tyre disposal when you buy a new tyre. Supplier should take it off you. uPVC – Take to the Council recycling centre on Docks Way. Vacuum cleaners – If working donate to Tip Shop or other charity shop. If broken take to the Council recycling centre on Docks Way. (most are too large for the blue box). Video Tapes – Cannot be recycled. Washing up bowls – Not at kerbside but take down to the Council recycling centre on Docks Way – hard plastic. Wood – Not at kerbside but taken down at the Council recycling centre on Docks Way. Yoghurt pots – Red bag. Zimmer frames – Ok we had to find a “Z”. Donate to charity shop or take down Council recycling centre on Docks Way.